In an effort to find a dietary supplement that sharpens the mind and offers a boost to the brain. Everyone is hoping to become more focused and cognitively more alert in order to both improve their memory, stay awake longer and be overall more productive in their day-to-day lives. 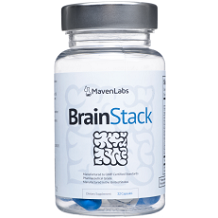 Today we are reviewing Maven Labs Brain Stack a nootropic which supports neurotransmitters in your brain by improving cognitive functions, concentration, and memory. Other Ingredients: Gelatin, Magnesium Stearate, Silica, Titanium Dioxide and F&DC Blue #1. Vitamin B6 helps with brain development and general brain functions; Vitamin B12 controls homocysteine levels; Acetyl-L-Carnitine HCL, an amino acid that reduces fatigue; Mucuna Pruriens boosts concentration, focus, and energy levels; Magnesium Glycinate helps to improve memory; Pterostilbene prevents cognitive decline; Hericium Erinaceus improves nerve health and the development of synapses and neurons. The product label suggests that to start with, it is best to take one capsule in the morning along with food. After seeing its desired effects, you may choose to increase the dosage, but to 3-4 capsules. The maximum dosage is 8 capsules in a 24 hour period. This product has caffeine and individuals who are sensitive to caffeine should be aware of its presence in this supplement. There also may be long-term side effects with Huperzine A but conclusive research is still being done. 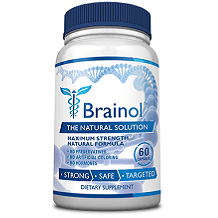 To buy Brain Stack, a bottle of 32 capsules costs $39.95 which is not inexpensive by any means. We were surprised to see the high price without the ability to purchase multi-packs to bring the price down. On Amazon, there appear to be discounted options if you buy 2, 3, or 4 bottles at a time if you go directly to Maven Labs website, but the website was down at the time we were writing the review. Amazon advertises that the product comes with a 60-day money back guarantee. But in doing further research it is for unopened bottles only. Again, coupled with the high price this means that if you decide to try the product and don’t like it, you are out the money and the price is not cheap. Our feeling is that this will surely dissuade interested buyers from wanting to try the product. If Maven Labs were more confident in their product, they would surely encourage buyers to try it and assume that they would be hooked on the product. This is unfortunately not the case. This product is made in the USA in a GMP certified facility, and comes with a 60-day guarantee but otherwise, we have a lot of questions about this product. First of all the website for Maven Labs was not working and there was no information about what the problem was. Second, the product is very expensive and as a product that is designed to help support memory and concentration, it just seems like the assumption is that the potential buyer would not have any trouble dolling out that much money for a brain booster type product. But finally and perhaps most importantly, the product is not well reviewed overall and also does not appear to be used so much. None of this inspires consumer confidence and so with that, we can’t put a strong stamp of approval on this product.